"Players can also unlock different features within various levels to make it even more challenging as they go," Simon Gojcaj, president, U.S. Publications, Inc., says. "There's enough variety between levels to keep Slingshot Candy Man enjoyable for a long time." DETROIT, Mich., April 2, 2014 (SEND2PRESS NEWSWIRE) — It’s sweet! Slingshot Candy Shooter released by U.S. Publications, Inc. is a free HD game for iPhones and iPads. Designed for people of all ages – play alone or play with family and friends. Multiple players can face off on Facebook or a single player can have a little fun and simply unwind. 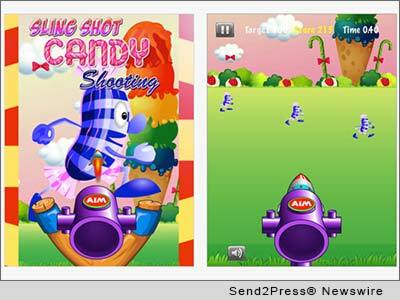 Slingshot Candy Shooter tasks players with hitting as many candy men as they can. Rocks are fired from a slingshot that is easily controlled with a tap of the finger. Just pull the slingshot’s elastic back and release. A practice mode gives players the lay of the land and from there, the sky’s the limit. With unlimited levels, players can aim high. The game also saves previous levels achieved, so players don’t have to start from scratch each time they play. Players rack up points based on distance and damage. And, a rocket launch feature can quickly catapult your score. Players can only move to the next level once they have filled up the points’ meter at the top of the screen. Zoom play, replay features, catchy music and bold colors all make this free game an easy one to get hooked on. It will satisfy any sweet tooth and players are sure to be addicted in no time. To get the free game, visit: https://itunes.apple.com/us/app/slingshot-candy-shooter-free/id843285370?mt. – Photo 300dpi: Send2Press.com/wire/images/14-0402-slingshot_300dpi.jpg . – Photo Caption: Slingshot Candy Shooter by U.S. Publications, Inc.
News issued by: U.S. Publications, Inc. Original Keywords: Simon Gojcaj, U.S. Publications Inc, iphone app, ios games, Slingshot Candy Shooter U.S. Publications, Inc. Detroit Michigan DETROIT, Mich.
News Source: U.S. Publications, Inc.
More from U.S. Publications, Inc.
RSS News Feed for U.S. Publications, Inc.
REFERENCES: Apple Mac and iOS News, Simon Gojcaj, U.S. Publications Inc, iphone app, ios games, Slingshot Candy Shooter U.S. Publications, Inc. Detroit Michigan DETROIT, Mich.